I’ve never been big on all the hoopla that surrounds New Year’s Eve. As a serious introvert, my perfect celebration involves enjoying a nice quiet evening with a fire and a couple of glasses of wine. If I’m feeling really adventurous, I’ll break out the DVD player and pop in When Harry Met Sally (my favorite feel good movie of all time)!! But back to the topic at hand! What I really want to do is introduce you to Harry Urban, founder of the Forget Me Not community on Facebook. It just so happens that he and his wife, Hazel, are hosting a virtual New Year’s Eve bash to ring in 2014! What’s that, you ask? Well, read on for more information! I had a chance to talk with Harry for the first time during a video chat over the weekend and really enjoyed the conversation. It’s one thing to hear from care partners and other advocates, but getting input from the people who are living with this disease day in and day out is particularly enlightening. I have immense respect for people like Harry and Norrms McNamara who are so open and honest about what it’s like to receive that diagnosis and live with dementia. How I wish I’d been able to talk to one of these gentlemen years ago in the early stages of my mom’s illness. After Sunday’s call, I was inspired to do a post on Harry and asked if I could email him a few questions. Of course, he was more than willing to oblige and I’m happy to be able to share this insightful Q&A with you. AN: So many people who are diagnosed fall into denial and/or depression, and they commonly withdraw more and more as the disease progresses. You have managed to do the opposite so beautifully. To what do you attribute your positive attitude, desire to raise awareness, and ability to inspire thousands of people? HU: Like so many others, I fell into denial and depression when I was first diagnosed. I was scared and didn’t know what my future was going to be like. I explained my diagnosis to my family and friends and was quickly abandoned by most. They just didn’t know how to deal with what I told them. This only added to my depression, and I realized this should never happen to anybody. I started to pick up the pieces and made a vow I would try to help others so they would never have to go through the hurt and pain I did. I spent a considerable amount of time trying to figure out why patients with dementia are treated like this. I came to the conclusion that people are not in general nasty, but rather, they don’t understand the disease. The same goes for someone that was diagnosed; they don’t know what the future holds so they assume the worst. It appeared to me that education was what is needed to better understand what our lives are like. The myths and stigmas associated with dementia had to be broken. The person who was diagnosed had to believe their life is not over but many fruitful years lie ahead. Over the past several years I have been telling my stories with amazing results. I don’t get pity, but the ideas of dementia are changing. I like to think I am spreading the word of HOPE, not a cure, but a better quality of life for us suffering from dementia. AN: Who is your greatest inspiration? HU: I have so many. All of them suffer from some form of dementia. I have a friend, Kenneth Teaspoon Overcast who suffers with dementia. What an amazing man; he realizes that he lost most of his skills but still manages to live a wonderful life. He is surrounded by family and friends that simply adore him. The support his family showers him with cannot be beat. Every bump in the road that comes along, he handles with grace. Ken suffers greatly but never lets his disease control his life. I want others to enjoy the happiness Ken has living with dementia. Ken inspires me to speak out so others can also be happy. AN: What was the inspiration for Forget Me Not, and how long has the group been in existence? I struggled with my emotions when I was first diagnosed and join several support groups. I found out that all of them just did not fill the void I had. Prayers and hugs are nice but I needed more. I wanted to talk about my disease without being judged. I wanted a safe, comfortable place that I could vent about my disease and explain why I do the things I do. I wanted a group that raises awareness, where members share their stories in order to help others. My friends knew I was unhappy and convinced me to create a group that offered love and support but also gave members the opportunity to discuss their disease. February of 2013, I did that by creating Forget Me Not. I soon realized you cannot have a successful group if it was all doom and gloom so we created “sister” groups so we could escape the frustrations of Dementia. We also started a Spanish group called No me olvides for the Spanish community. This group is a mirror image of Forget Me Not with the same ideals. AN: Can you share a little bit about your virtual New Year’s Eve party? What is it? What made you decide to do this? How can folks join the fun? HU: One of the worst feelings for those living with dementia is the feeling of loneliness, especially around the holidays. On Christmas Eve, my wife and I were talking about how many people are spending the evening alone so we started a Zoom video chat and invited anybody on Forget Me Not to join us to simply say hello or spend the evening with us. It was a huge success and many laughs were shared that night. That is when we thought why can’t we have a virtual New Year’s Eve party? Many care partners can only celebrate bringing in the New Year at home, so why not stop in to visit us! 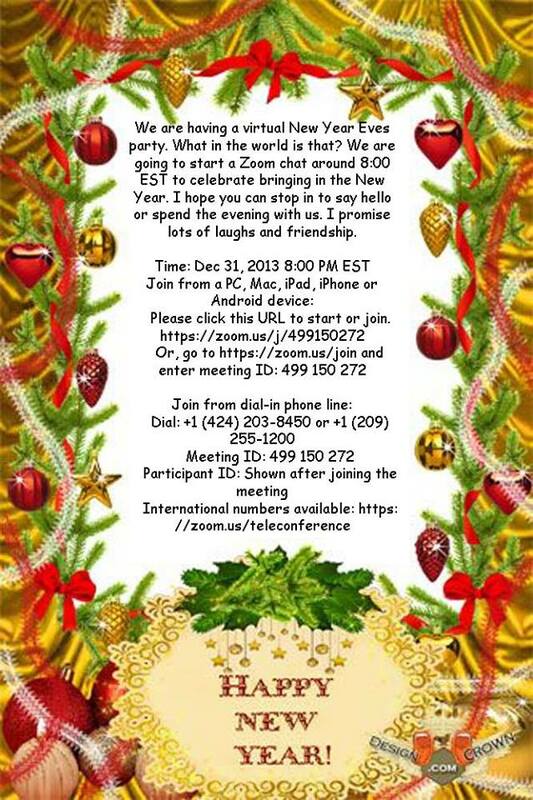 I plan on starting a Zoom video chat at around 8:00 EST so anyone can stop in to wish each other a Happy New Year or stay and party with us to bring in the New Year. As you can see based on Harry’s comments, there’s so much we can learn if we’re just willing to listen. I think what inspires me so profoundly is his grace and wonderful attitude despite being dealt what we can all agree is such an unfair hand. Harry reminds us that while research is vital, it’s equally important to give today’s dementia patients the absolute best quality of life possible. He serves as a role model to those who have been and will be diagnosed – life does go on, and it can be a great life. If the day should come that I walk in Harry’s shoes, I can only pray to do so with half as much poise, courage, and sense of humor. Thank you for all you do, Harry, and most of all, thanks for being you! Harry also hosts the Forget Me Not Memory Cafe, as well as a weekly video chat support group. Be safe everyone, and Happy New Year! This is wonderful, Ann. Thanks for sharing Harry’s story. Happy New Year!